I am delighted that Triangular Partnership: the Power of the Diaspora, the pre-publication review edition of the 160 page book I edited has been published and distributed today, including my chapter on professional mentoring. 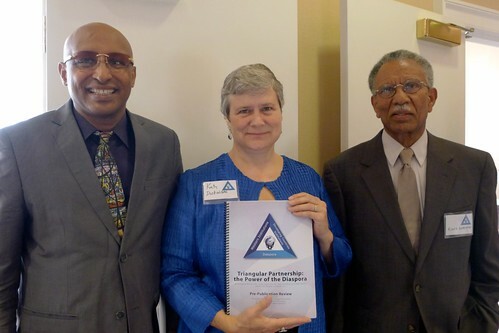 Here I am with Dr. Enawgaw Mehari, Founder and President of the People to People (P2P) organization and Dr. Kinfe Gebeyehu, Vice President of P2P, at the 5th Annual Global Ethiopian Diaspora Conference on Health Care and Medical Education, in Washington D.C. About a dozen of the chapter authors attended the conference so I asked them to sign my copy. 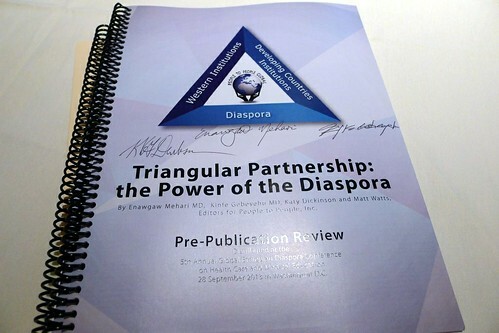 The free download version is available at http://new.peoplepeople.org/pre-publication-preview-triangular-partnership-the-power-of-the-diaspora/.